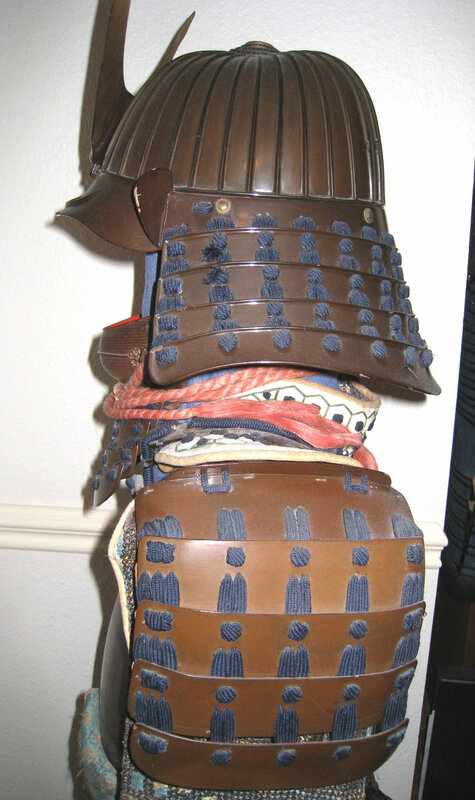 DOH: The body armor of this set is a 2 section NAMBAN (southern barbarian) style armor. It was made for an extremely small person, possibly this is a child armor. The bullet pouch is clearly visible, and the cloth pattern matches the KOTE and SUEATE. Brass FUKURIN lines the entire open areas of the DOH. The lacquer is a medium brown, and is in excellent condition with the exception of a few cracks and chips on the back plate. This is a very late DOH as the attached KUSAZURI have metal turn pin style of attachment. This is a unique and interesting detail of this armor. KABUTO: The helmet is an iron 33 plate SUJI (ridge) HACHI. Again, this is another unique detail of this armor. A 33 plate count is unusual. It has a wonderful pumpkin style shape, and is in excellent condition. The 5 section KUSAZURI is original to this helmet. The blue silk lacing is also in excellent condition. The entire helmet in in excellent condition, with an intact liner. The chinstrap is a red dyed hemp cord. This helmet has a 4 piece copper alloy TEHEN, excellently carved. The MAEDATE is made of wood and leather, and painted with gold lacquer. The KAMON on the FUKIGAESHI is probably from the SASAKI family. MEN: The face mask is a KAGA style HANBO, and is excellently well cut and high quality. It is a natural rust color with a brown lacquered YODARE KAKE. The lacing is blue and matches the helmet. This is another interesting feature of tis armor. SODE: An pair of iron brown lacquered SODE are included. They have a leather and cloth liner. The lacing style matches the rest of this armor. SANGU: The SANGU (KOTE, SUNEATE, and HAIDATE) are a matched set with the exception of the HAIDATE. The HAIDATE is made of lacquered leather plates, and does not match the rest of the armor. All of these pieces are in excellent condition with the exception of the SUNEATE which show sings of water damage. The KOTE show an excellent feature of a hidden compartment. This is very rare. This armor is unique as it has many features that very few other armor have. This is a composite armor, however the lacing style matches throuout the set. This armor has been restored lately. In all, this armor is put together from several other pieces, but has a complete style unique to itself. An excellent HITSU comes with the suit and is in good condition.